We like to be an active part of communities across Australia. At the heart of our community commitment is Ronald McDonald House Charities (RMHC). RMHC is one of Australia’s major children’s charities and helps thousands of seriously ill children and their families every year. To raise funds for RMHC, McHappy Day is held annually and everyone in the McDonald’s business – franchisees, crew, managers, head office staff and suppliers – participates in some way. Celebrities and local personalities join in the fun and two dollars from every Big Mac® sold is donated to RMHC. Other products and merchandise are also sold to contribute to the fundraising. We like to focus on activities that improve the health and wellbeing of Australian children. We contribute to sporting organisations that develop kids’ sports skills and provide opportunities for them to play. Hundreds of sporting clubs across Australia benefit from the support of their local McDonald’s restaurant and in some states restaurants work together to support state-wide programs. 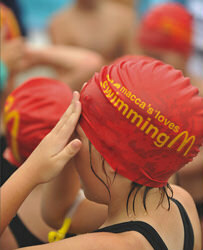 Macca’s restaurants are a major supporter of Little Athletics in New South Wales, Queensland and Western Australia. The relationship is designed to encourage more children to participate in this fun, active sport. Macca’s On Your Team, an initiative by McDonald’s restaurants in Victoria, provides essential sporting equipment to cricket, basketball and AFL community clubs across the state. The program sees McDonald’s partner with Cricket Victoria, Basketball Victoria and AFL community leagues to ensure children have access to inclusive sports programs and lead an active lifestyle. Macca’s is also a major sponsor of Swimming Queensland. Together, we sponsor selected swimming meets and support programs designed to encourage children to compete and have fun. Macca’s restaurants in South Australia are the major sponsor of the South Australian National Football League junior development program. The sponsorship includes coaching clinics for kids of all levels. The goal of the junior development program is to increase participation in Aussie Rules and encourage more kids to be active. Western Australian McDonald’s restaurants support grassroots sport in the state through the Macca’s Junior Sports Grants. The program supplies grants to schools or clubs who apply to provide basic sporting infrastructure for an activity which is likely to encourage kids to participate in sport. As part of our environment strategy, we support organisations and initiatives that foster an understanding of environmental issues and provide practical support to building sustainable communities. McDonald’s has been a sponsor of Clean Up Australia and its major annual event, Clean Up Australia Day, since its inception in 1989. 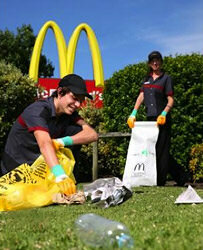 Each year, McDonald’s crew and managers join their local communities to help clean up rubbish in the area. We receive lots of great ideas on how we can get involved in various types of events. To best present your proposal, read the tips below to see if your idea meets our criteria, then apply for either a local, state or national sponsorship. We want to deliver valuable benefits to the wider community. We want to help children live a more balanced, active and enriched lifestyle. Our sponsorships must reflect a grassroots and community focus. Being one of many sponsors in a cluttered commercial environment. Please contact Customer Service via the contact page. Please refer any local sponsorships to your local restaurant Manager.